It’s an age old tradition in India to wait for an auspicious day or period in the year to start something new. This new thing could be like buying a car, a house, some jewellery, investing in gold for the long term and so on. The list could be endless. The main reason for this phenomenon is people’s belief that making a good begging on an auspicious day brings in divine blessings. In India there are many such occasions when a large number of people prefer to start something new or buy something, for the long term. Two days before Diwali is Dhan Teras when people prefer to buy some jewellery, gold or metal items. Again for a large number of people Akshaya Tritiya, which usually comes in April every year, is the best day to invest in gold. There are also people who prefer to buy new things around Dushera. Of late financial planners and advisors are prodding their clients to start investing for the long run on an auspicious day. They say that although investing for the long term could be started on any day, irrespective of market conditions or the occasion, but if someone starts investing on an auspicious occasion, he/she usually shows some extra sentimental attachment to such investments. “He won’t redeem the money easily, which in turn pays good dividend in the long run,” said a Mumbai based financial planner. They, however, say that starting to invest on an auspicious day, like any other investment on any other day, should also adhere to the basics of long term investing. These are: Invest with a financial Goal in mind with a particular time horizon; Invest regularly; Invest for the long term to minimise the negative impact of price volatility in the asset class you are investing in; and have patience to use the power of compounding to your advantage. According to one financial planner, when one invests without a financial Goal in mind, the investor may be tempted to redeem his/her investments at any point of time or at times when the market volatility makes him/her feel jittery. If the person has a financial Goal in mind and also a time horizon, usually the person does not take the money out before the Goal is reached. Financial planners and advisors also say that market volatility is more pronounced in the short term while time neutralises most of its negative impact as investments are held for the long haul. The power of compounding also kicks in over the long term. So regular investments over several years can help an investor accumulate huge wealth. For a regular and disciplined approach to investing, an investor can take the systematic investment route, popularly called SIP, in any type of mutual fund scheme. An SIP could be set up in Equity, Debt and gold funds to realise their short, medium and long term financial Goals, financial planners and advisors say. A new trend is also catching up among investors, that is of gifting an SIP, which one could start on an auspicious occasion also. It’s been more than a decade that fund houses in India have been educating investors about how systematic investment plans (SIPs) could help them achieve their life’s financial Goals. Those Goals could be short term, a Goal that one intends to reach in a few months to a couple of years. Some could also be medium term Goals, the ones which an investor intends to reach between two years and five years. And some could be the long term Goals, those which are more than five years into the future. Although the going was tough during the initial years, as the latest numbers show, the perseverance of fund houses are showing very good results as the latest industry data show. Monthly SIPs are now more than a 1.6 crore in number and in September 2017 alone, over Rs 5,500 crore has come into the industry from SIPs. Beyond the numbers too such efforts have shown results, although in some cases in a slightly misguided manner: At times investors who are not well versed with the investing process say that they want to invest in stocks, gold, SIPs etc. Erroneously these investors think SIPs are a new kind of financial assets. The reality, however, is that SIPs in mutual funds are the bridge to invest in financial assets like stock, Debt and gold and by investing in these assets investors can achieve their financial Goals, financial planners and advisors say. One could invest in bonds and fixed income instruments by setting up an SIP in a bond fund. Similarly one can invest in stocks through an SIP in an Equity fund while for investing in gold funds you can set up an SIP in gold fund of funds. 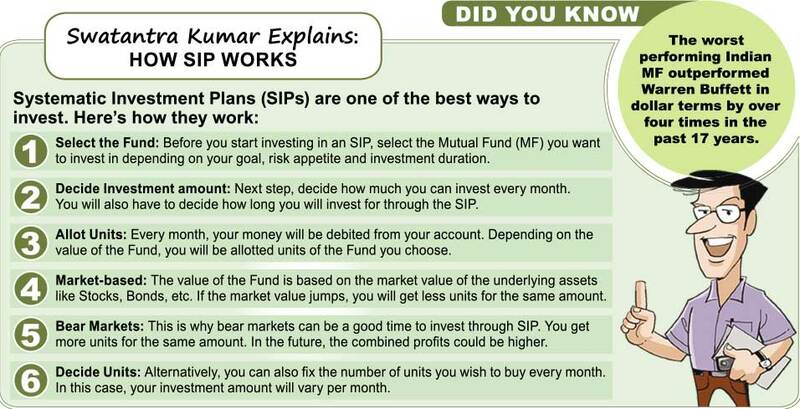 This is one part: Using SIP in a mutual fund scheme as a bridge to invest in various asset classes. The other part is that one could use the SIP route to achieve life’s financial Goals. One could set up an SIP in a mutual fund scheme that is suitable for investments for a few days to a few months, to achieve short term Goals like paying the child’s school fees on a quarterly basis. Similarly one could set up SIPs to reach medium term Goals like paying the initial amounts to buy a house in 5-7 years and reaching long term Goals like planning a retirement corpus for the self. Financial planners, advisors and fund industry officials also say that for investors with a regular and steady income stream, investing through the SIP route is a huge blessing. “You can match the regularity of your investment with the regularity of your income. Not many people can afford to do that,” said an official with a domestic fund house. It means as one gets his/her salary every month, through the SIP route the person can also invest every month to achieve his/her financial Goals without so much extending the monthly budget.